One Laptop Per Child in Haiti... Is That Possible? I was dumbfounded once I took a minute to watch these videos and understand the concept behind this project and how beneficial it will be if used effectively in Haiti. Why give a laptop to a Haitian child who may have no electricity or even running water? How do you feel about the project now in terms of education in Haiti after watching these videos? 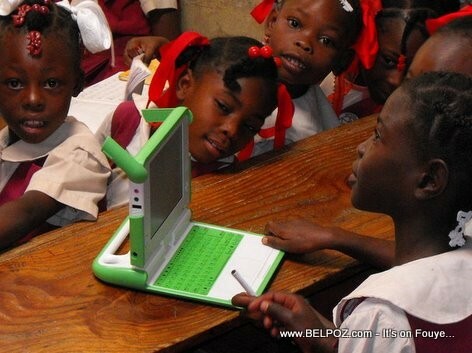 The question is should we want laptops for Haiti kids? I believe technology is important for advancment of society is important but to much of a good thing can ruin you as well. I look at the effects of lap tops and texting has on American kids and it is sad. Their penmanship is poor, they cant spell cause everything has a spell check, they rely on abbreviations, writing has turned into copying and pasting, and the knowledge becomes disposable. But under condition that kreyol is always also provided as a teaching language. Anglophones, Francophones, Hispanophones and the like are welcome help but never wholy free of linguistic imperialism. So bilinguism, with kreyol ever as second is highly recommended.